Mario Bava's 1964 giallo Blood and Black Lace is a beautiful piece of workmanship, stunningly crafted with obvious care - and punctuated by some of the best violent ends. Velvet-laced mannequins. Exquisite fashion models. A thunderstorm-racked night besieges the Christian haute couture fashion house. Inside, beautiful young models prepare to strut their stuff decked in the latest garb. But outside, model Isabella (Francesca Ungaro) scrambles for her life as a black-gloved, masked killer pursues her through the woods. The lone beauty goes down. Discovering Isabella's body in the wardrobe closet, the fashion house owner Madam Cristina Como (Eva Bartok) alerts the police and an investigation is opened. Meanwhile, fellow model Nicole (Ariana Gorini) finds Isabella's diary and soon a vibe of secrecy and fear permeates the air. What disastrous scandal could Isabella's tiny red diary hold? Leaving the book behind, Nicole rushes to her ill boyfriend's shop and is startled to find the place empty...almost. The masked killer is there, toying with Nicole like a cat - then offing her with one swipe of the tri-steel claw he dons...firmly embedded in the girl's face. Meanwhile, Nicole's friend Peggy (Mary Arden) has snatched the diary and has gone home for the night. Once there, she takes the opportunity to peruse the pages...the dastardly news of her own personal scandal there on the pages! Frantic, she burns the diary whole. But the killer has arrived at Peggy's place. Beating the girl mercilessly, the killer tries to get her to reveal where the diary is. Finding that she's burned the book, he does the same...to Peggy's face. Now with four models dead (two of the bodies having been discovered), the police question five men involved in the business of the fashion house...detaining them for everyone's general safety. The girls of Christian depart for home. Greta (Lea Krugher) travels to her home in the country...unaware that she's next. Once inside, she discovers the murderer has suffocation by pillow in mind for this fourth victim. But the chief suspects were all safely detained during Greta's murder...who can the killer be then - and to what end? What person would later kill lovely Tao-Li (Claude Dantes) in her bathtub and then cut her wrists to make it look like a suicide? Mario Bava's Lace is one long standout. But certainly it's the 'hot stove on the face' sequence that seems to hearken forward to what would come in terms of horror cinema. The sequence emblazoned with Bava's trademark color filter (this time red), poor Peggy screams in terror at the scarlet pulsating orb inches from her face, her eyes wide open. Sizzling delight. Then there's the quite memorable death of Tao-Li in the tub. Not as lovably chronicled as Peggy's death or as memorably cat-and-mouse as Nicole's frenzied struggle. But Tao-Li's strangely calm countenance during her forcible drowning...as well the final shot...are sheer power orchestrated by the director. With Lace, did Bava create the giallo form that would reign so predominately for the next dozen odd years in Italian horror cinema? Certainly, powerful evidence to the affirmative, Lace is rife with all the conventions of the form: black-gloved killer, stylish slayings, beautiful women...and a well-done denouement revealing the murderer and motives. Bava would follow Blood and Black Lace the following year with the ALIEN-esque Planet of the Vampires before returning to a more earthly terror in 1966's Kill, Baby, Kill!. 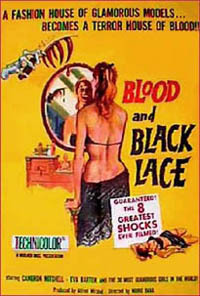 Blood and Black Lace is alternately known as Sei Donne Per L'assassino, Fashion House of Death and also as Six Women for the Murderer.